St. Patrick - Patron Saint and Apostle of Ireland Pray for Us! St. Patrick - Patron Saint and Apostle of Ireland Pray for Us! Saint Patrick is one of the world’s most popular saints, and is known as the Apostle of Ireland, for good reason. Patrick was born in Roman Britain, but around age 16 he was captured by Irish pirates and sold as a slave to a chieftain in Ireland named Milchu. He was forced to be a shepherd and always suffered from cold and hunger. Patrick was enslaved for about six years. He became fluent in the Irish language and culture. At the time, Ireland was a pagan country and practiced Druidism. However, Patrick chose not to follow their religion and instead grew closer to God. He would constantly pray throughout the day- while he ate, tended the sheep, and till he fell asleep. It was around this time too that he started writing his memoir: The Confession. This is a collection of writings from the saint himself that shows us who Patrick was, and how he felt and acted. Encouraged by this, Patrick became a priest and eventually a bishop. He then returned to Ireland to spread the Gospel. There are many legends of Saint Patrick’s missionary in Ireland. One prominent claim was that he met with one of the Druid chieftains who tried to kill him. Instead, Patrick converted the chieftain and was allowed to preach the Gospel throughout Ireland. He converted thousands, chieftains and slaves alike. He also began building churches throughout the country. He would often use the shamrock to explain the Holy Trinity. He also wrote a poem called The Breastplate, also called Lorica of Saint Patrick. It is about faith and trust in God. Patrick gathered many disciples throughout the country, including Benigns, his successor. His missionary was not without its difficulties, however. Those who kept their old religion did not like Saint Patrick spreading Christianity. They caused him much suffering and even tried to have him killed on several occasions. Despite this, Christianity continued to grow in Ireland. After years of travel and evangelizing, Saint Patrick died on March 17 in Saul, where he built his first Irish church. He is buried in Down Cathedral, Downpatrick. His grave was marked in 1990 with a granite stone. His feast day is on March 17. He is the patron saint of Ireland, engineers, and against snakes. He is normally depicted with a shamrock, cross, baptismal font, or driving out snakes. 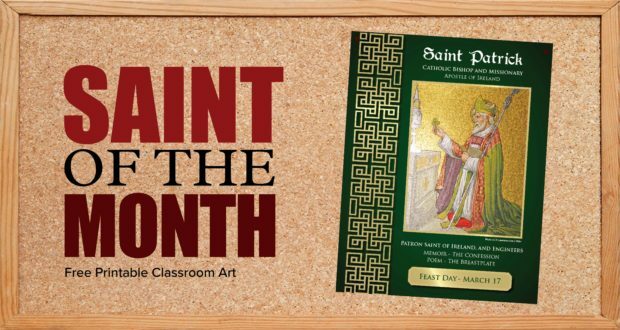 Download the free printable monthly saint page using the button below. You can pin it to your classroom wall or place it on your refrigerator to help your children learn more about Saint Patrick.